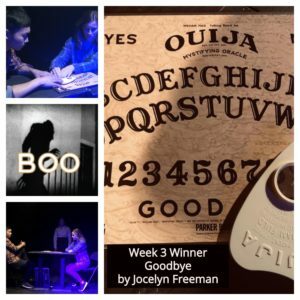 Congratulations to Jocelyn Freeman whose play “Goodbye” is the week three winner of the 8th annual Players Theatre Short Play Festival – Boo! 2018. “Goodbye” is a tragedy focused on the misuse of a Oujia board that challenges the boundaries of life, death and teenage love, proving that nothing is scarier than heartbreak. The production was also directed by Catherine Lamm and the talented cast included: Martha Epstein as Lottie, Anna Morreale as Claire and Jee Heng Liao as Evan.